Jason and Marisa Buchanan of Minonk are the proud parents of twins born Friday, 12/26, at OSF Saint Francis Hospital in Peoria. Kaya (Ki' a) Milynn weighed 3 lbs. 15 oz. and Kade Jason weighed 3 lbs. 1 oz. Grandparents are Dave and Sherri Stokowski, Mike and Sheila Gerdes, all of Minonk; and Eric Hill of Normal. Great-grandparents are Art and Dot Wilson, Voyatt and Marge Hill, Mary Ann Stokowski, all of Minonk; Everett and Geri Buchanan of Toluca, and Ted and Mary Bohlander of Bloomington. Rebecca Ann Steinbach: Tricia and Kyle Steinbach of Crown Point, IN. are the parents of their first child, Rebecca Ann born October 21, 2003 at Methodist Hospital, Merrillville, IN. Becca weighed 6 pounds 6 ounces and was 19 inches long. Maternal grandparents are Jannie Herman and Bill Herman Jr. of Minonk. Paternal grandparents are Mr. and Mrs. William Steinbach of Mayville, WI. Maternal great grandparents are Lorraine O'Brien and Mr. and Mrs. Bill Herman Sr., all of Minonk. Paternal great grandparents are Gladys Rhodes of Dixon, IL. and Robert Allen of Ottawa, IL. Alysa Evans: Eric & Dawn Evans are proud parents of a new baby girl. Alysa was born October 13, 2003. She weighed 7lbs. 11ozs. and was 19 inches long. She has two sisters Kayla 14, Abygail 16 months, and one brother Thomas 12, all of Minonk. Parental grandparents are Thomas and Pam Evans, Roanoke. Maternal grandparents are Rodney Brown, Bloomington. Kim Brown, Normal. Evalynn and Elizabeth Willis: Michael & Sherry Willis are proud to announce the birth of Twin Daughters. Evalynn Kathleen Willis was born at 3:51 PM on August 31, 2003 followed one minute later by her sister, Elizabeth Catherine Willis. They were born at Carle Fouindation Hospital in Ubana, IL. Evalynn weighed in at 2 lbs, 12 oz and was 16 inches long. Elizabeth weighed in at 5 lbs and was 18 inches long. After spending some time in the NICU, we're proud to report that everyone is home and doing great! Evalynn and Elizabeth join their big brother, Daniel McConnell (13) and big sister, Mitzi McConnell (9). Paternal Grandparents are David Willis of Metamora and Catherine Willis of Boston, MA. Maternal Grandparents are Kathleen (Roger) Wilson of Beloit, WI and Daniel (Joyce) Jerry of Aitkin, MN. 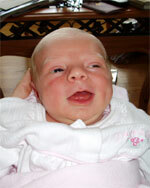 Carli Jane Schmidt: Carli Jane Schmidt was born on April 22 to Eric and Sheri Schmidt of Byron Center, Michigan. Carli will soon be home with her older brother, Austin, nearly age four. Paternal grandparents are Judy Morrow Schmidt of New Berlin, WI. and Gerry and Sandy Schmidt of North Aurora, IL. Elaine Morrow of Green Valley, AZ is the paternal great grandmother. Maternal grandparents are Phil and Jan Lombardi of Wheaton, ILL. Maternal great grandmothers are Katherine Radaz of DesPlaines and Gloria Lombardi of Elmhurst. Lawrence Socoby Denson: Mr. & Mrs. Edwin M. Denson, Jr. of Chicago announce the birth of their first child, a son. Lawrence Socoby Denson was born Sunday, April 13, 2003 at 8:45 a.m. at Prentice Women's Ctr., Northwestern Memorial Hospital in Chicago. Weight 8 lbs., 7 oz., Length 20 1/2 "
Maternal grandparents: Mr. & Mrs. Lawrence J. Socoby, of Needham, Mass. Paternal grandparents: Maryann Denson, and Edwin Sr. and Sharon Denson, all of Chicago. The senior Edwin Denson is a former Minonk resident (MDRHS class of '57). Springer triplets: Trina and Scott Springer of Belleville, IL. are the parents of triplets born Saturday, March 29, 2003 at St. Elizabeth's Hospital in Belleville. First born was Zachary Bryan weighing 5 pounds 2 oz., 18 inches long at 8:25 am. Katelyn Nicole was born at 8:26 am weighing 4 pounds 15 oz, and also 18 inches long. Taylor Lorraine was born at 8:27 weighing 4 pounds 3 oz and 17 inches long. The triplets have a half brother Derrik Gaspardo of Minonk. Maternal grandparents are Jannie Herman and Bill Herman Jr. of Minonk. Paternal grandparents are Joan Springer of Belleville and Mr. and Mrs. Bob Springer of Texas. Maternal great grandparents are Lorraine O'Brien and Mr. and Mrs. Bill Herman Sr., all of Minonk.